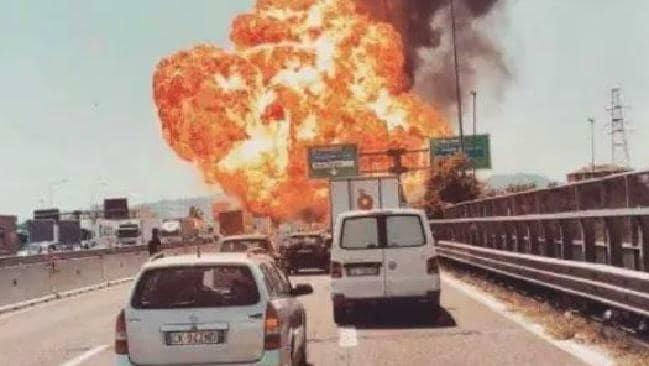 A gigantic explosion took the life of one person and injured another 56 on a highway in Bologna, Italy. Local media are also reporting that the explosion was caused by an accident involving a truck that was carrying flammable substances, which exploded upon impact. Many videos of the explosion surfaced, mostly taken from inside passing cars where people were able to at least shield themselves from the explosion and the heat from it. One video was taken from just a few hundred meters away from the blast but succeeded in shaking the car. Another video showed a crumbled overpass which collapsed from the impact of the explosion. There’s also the dramatic footage taken from a helicopter showing the huge impact of the explosion in affected sites in Bologna, the food capital of Italy which commands a strong number of tourists on summer holidays. Italian firefighters posted messages on social media saying they have already sent multiple rescue and emergency squads, including one from their urban search and rescue team. After seeing the photos of an accident and two other aircrafts crashes, I think it's a work of the secret agency(s). Someone didn't get a message from 1st plain crash.